The following is a guest post by Michael Waxman-Lenz, CEO and co-founder of International Education Advantage (Intead), a technology, marketing, and consulting firm specialising in international student enrolment. The author would like to acknowledge the research support of Edward Zhang and Xi Chen. Collaboration on joint programmes seems to be a great win-win solution for students, academic institutions, and the receiving and sending countries. The Chinese government has encouraged such collaboration in the past but more recently has increased its scrutiny and the rigour of its approval processes for joint programmes. We hear a broad-based consensus that it has become very difficult to get approval for such programmes for all but the most prestigious Western and Chinese universities. In this article, we analyse the available statistical information on these joint initiatives. two years in China +1 overseas +1 in China. The bottom line is that the Chinese students must study in China for at least two years over the course of the joint programme. Such programmes are different from an international transfer arrangement, which typically means that a qualified student can transfer to a foreign university/college after successfully completing his/her first year of undergraduate studies at a Chinese university. Students enrolled in international joint programmes should be granted two bachelor’s degrees – one from the Chinese university and the other from the foreign university/college – upon graduation. During the study abroad period, the students are still considered registered students of the Chinese university. In contrast to this, students participating in international transfer programmes are no longer registered students of the Chinese university after transferring, and will only receive a degree from the foreign university/college at graduation. The Chinese partner(s), considered as the equivalent(s) of your institution in China, may be a strong reference for the overall branding and marketing in China, which could overcome the difficulties or misunderstandings caused by ranking, in some cases. As Chinese students from the international joint programme are allowed to study overseas for no more than two years in most cases, the tuition revenue is lower than it is from fully matriculated students. Let’s also be frank about the advantages for both partners in respect to overall enrolment management, tuition generation, and international student recruitment: both partners generate tuition revenue. The Chinese entity is able to raise tuition on domestic students and the US, or more generally international programmes, can attract a regular flow of Chinese students with a predicable academic standard without the competitive recruiting effort. Our understanding is that the development of international joint programmes in China has undergone two basic stages. The earlier stage was guided by a set of tentative rules, by which any Chinese university in practice was able to collaborate with an unrestricted number of indefinite foreign higher education institutions to establish unspecified programmes. As a result, some Chinese universities became proactive in their approach to these loose regulations and effortlessly optimised their relationships with foreign partners by building up as many international joint programmes as they possibly could. For instance, Harbin Normal University (HNU) from the Heilongjiang province built all of its 19 existing international joint programmes with six Russian, two British, two Australian, one American, and one South African university over that period. In the latter stage of development, more restrictions were applied to the administrative approval of international joint programmes. It became more and more challenging for Chinese universities to create international joint programmes with foreign partners that did not have a recognisable academic performance in their own countries. In addition, programmes in certain academic fields, such as applied technologies and engineering, were preferred by the authority in the approval process. In practice, most Chinese universities were allowed to establish only one new joint programme. Let’s look at the overall distribution of the destination countries for the 760 programmes approved by the Chinese Ministry of Education. The following figure summarises the worldwide distribution by countries if they account for a sufficient number of programmes or region. 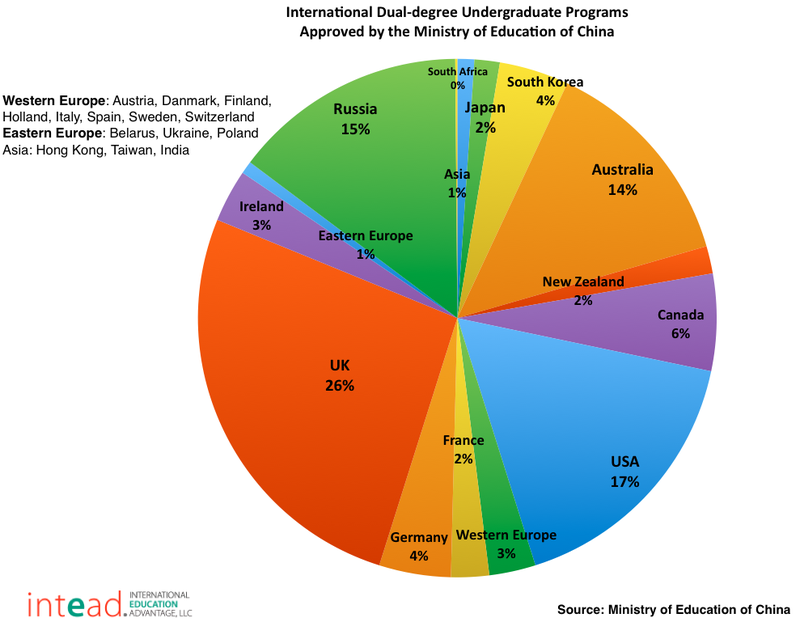 The following table highlights the top five destination countries for such dual-degree undergraduate programmes, indicating that UK schools account for a quarter of all such partnerships, followed by US schools with 17% and Russian schools with 15%. We do not know the distribution in terms of students actually attending these different schools in the destination countries. The country breakdown by attendance may look different. But it is noticeable that Russia has a significant number of programmes. It is also noteworthy that four of the top five countries with such dual degree programmes are English-speaking markets. Now let’s consider the regional distribution in China. The additional figure and table below list the regional breakdown of joint programmes within China as well as the top five provinces and cities (accounting for more than half of all established programmes). The northeastern province of Heilongjiang has a particularly active group of second and third-tier universities that have established a large number of programmes with Russian universities. These activities account for a majority of the programmes of the region as well as with Russia as a whole. It is also notable that Shanghai is number four on the list of established programmes and Beijing does not make the top five, despite the fact that Beijing and Shanghai host many of the most prestigious universities in China. We have a few thoughts on the cause of that lower priority for international programmes. Our interpretation is that these prestigious institutions do not see the need for such cooperation, at least at the undergraduate level, while other universities in China can create greater benefits for themselves and their student populations through forging such international links. Further, while the majority of the universities located in Beijing and Shanghai are the most reputable universities in China, it does not necessarily mean that they are the largest universities in terms of student population and undergraduate programmes. In fact, those universities tend to be more conservative about building international joint programmes, because it could be very difficult for them to find well-suited international partners and programmes and potentially embarrassing to collaborate with a lower-ranking foreign partner. Since Beijing and Shanghai are still single cities with large populations, an average-sized province in China containing at least a dozen cities usually has more universities than those two individual cities. Therefore, universities in Beijing and Shanghai do not have a big share of the overall international joint programmes in the country. As we all know, international enrolment of Chinese students has increased significantly over the past few years. Direct enrolment has driven this process, though we have not seen any reliable information on the breakout of enrolment figures. The market forces for direct enrolment are strong. Western universities are interested in maximising tuition revenue. Admissions departments in Western universities are tasked and organised to recruit full-time, degree seeking students. 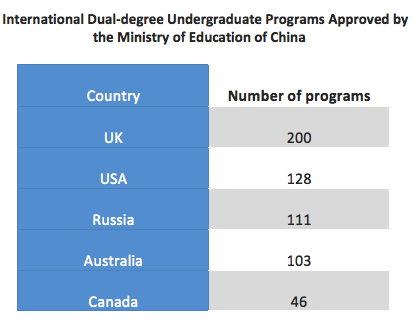 In particular in China, the commercial agent and counselling services drive direct student enrolment with or without direct collaboration with universities more than any other form of academic placement. At the same time, our subjective anecdotal impression is that the Chinese government and academic institutions have received less benefit from such arrangements than they had hoped and the honeymoon period has ended. In Western universities, joint programmes require strong academic sponsors and they have limited motivation to sustain the extra work over the long term. Admissions departments have to own the enrolment effort even if it does not fit neatly into their standard operating processes. Our thought is that joint degrees are a valuable contributor to educational mobility and globalisation. But as a professional education marketer and strategic consultant, we see a cloudy regulatory, institutional, and market environment inhibiting the continued growth and success of these programmes. For a broader view of channels and strategies for international recruitment, please see our list of 88 ways to recruit international students. This entry was posted in Agents, Asia, China, Higher Education, Regions, Vocational and tagged undergraduate admissions, education abroad, transnational education, student enrolment, undergraduate student recruitment.